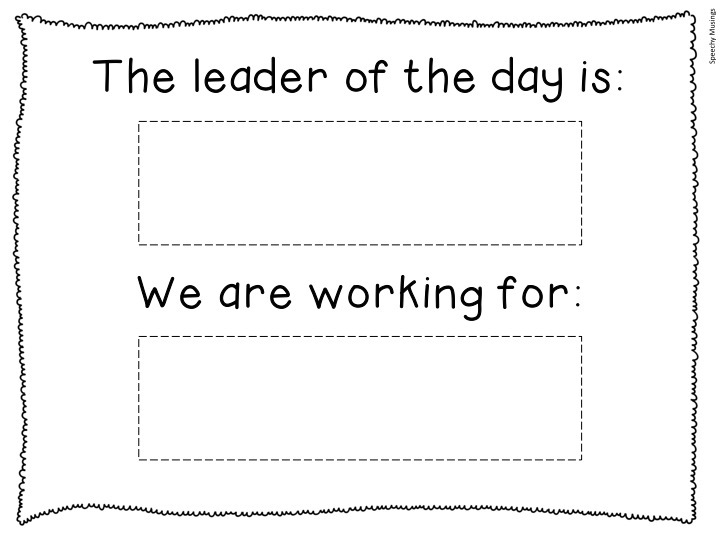 1) Being a leader and a helper reminder cards. This semester, we will be working on understanding what it means to be a ‘leader’ and a ‘helper’. Everybody, at some point in their lives, needs to understand how to do both. Nobody should ever always leader or always follow! So it is important for our kiddos to understand how to do both! At first, almost all kiddos are less than enthused when they are assigned the task of being a ‘helper’ for the day. But once most of them understood what to say and do to be a helper, they became much more comfortable. In my packet, there are the cards seen above. I laminate and give either a ‘leader’ or a ‘helper’ card to every child as they enter the room. You could also have them switch around the cards during different activities. 2) A different kind of reward system! Instead of using stickers or tangible rewards, I use things such as a dance party or the opportunity to have a ‘parade’. The great thing about working towards rewards such as these is that they also offer the opportunity for social communication throughout! For example, if they were to win a parade, they would need to work together as a group to plan the parade, etc… Win-win! In my packet, you will find a visual I use. Each day I hang it in the room to remind the girls of who is the leader and what everybody is working towards! 4) Conversational reminder cards. Sometimes, when people get excited we have a tendency to talk over one another instead of to one another. Our kiddos do the same thing, except they probably do it more often. 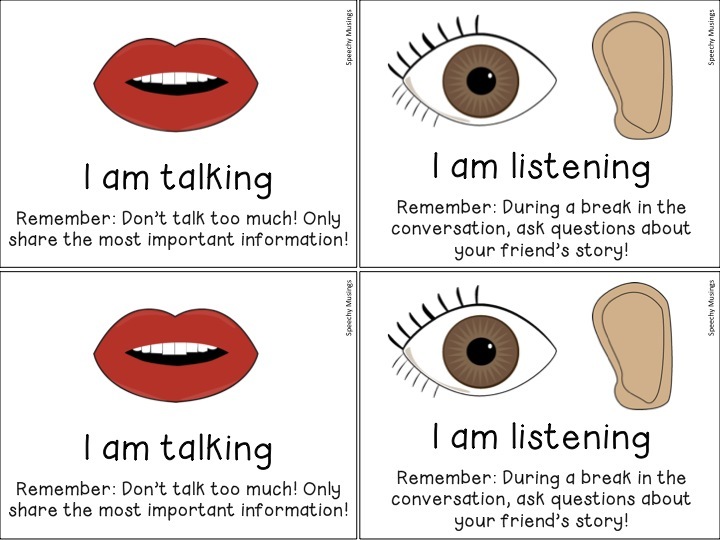 I print these cards back to back so on one side it says, “I am talking” and on the other it says, “I am listening”. If the conversation seems chaotic or disorganized, I reminder everybody to ‘pause’ and look at their cards. They can all flip it over to the appropriate side and decide which ONE person is talking. Then, everybody else should be listening! If any of those materials sound like they could be used in your speech room, head on over to my TpT store here for this FREE download! Enjoy! 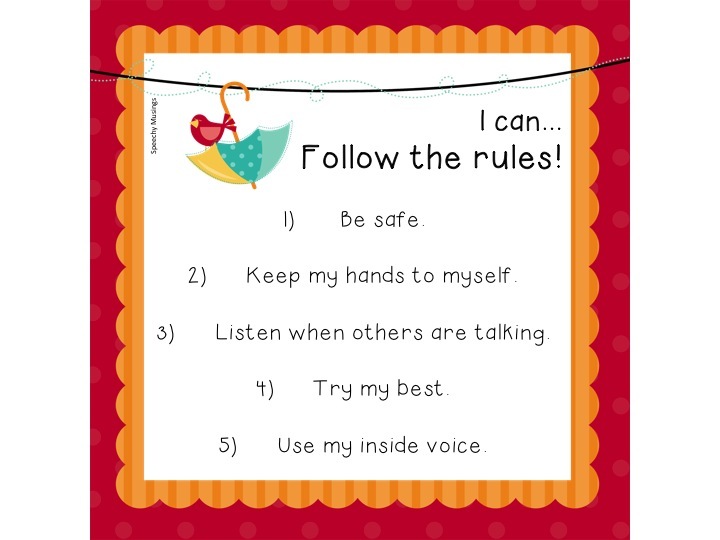 This entry was posted in Materials, Therapy Ideas and tagged free materials, pragmatics, social skills, TPT store by Shannon. Bookmark the permalink. Cute idea! Thanks for the freebies! Sharing! You’re welcome!! Thanks for sharing! These materials do look very useful. I really like the talk and listen flip card. 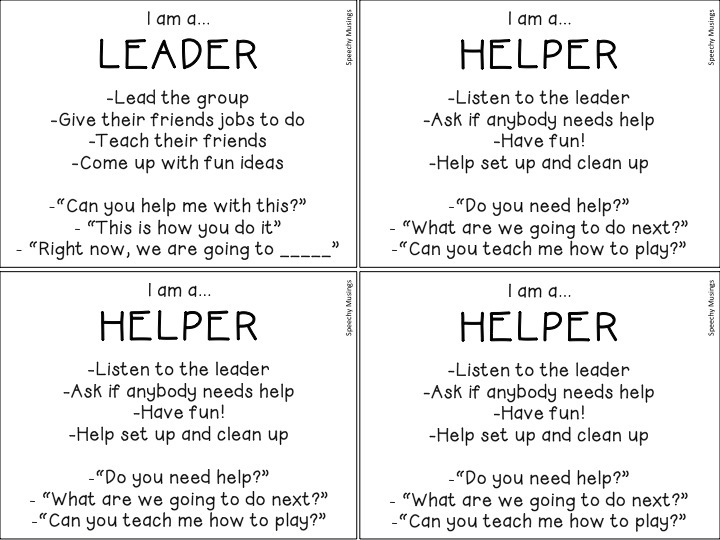 I love the idea of using leader/helper cards! Thanks!